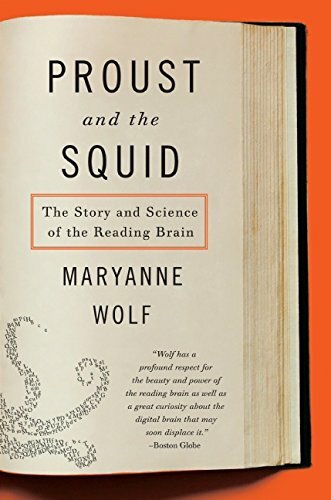 The following notes explore the five stages of reading development as proposed by Maryanne Wolf (2008) in her book Proust and the squid: the story and science of the reading brain. the expert reader (typically from 16 years and older). Please explore, and also visit the Stages of Literacy Development page for a more detailed discussion. Before we begin with the stages, there are two preliminary notes to make. Preliminary Note #2: Across this lengthy period of development, leaners are required to consolidate certain skills only to encounter new challenges. The one rule that applies equally is as follows: “Experts [agree] that readers, no matter which reading philosophy is followed, have to practice, practice, practice.” (You Need /r/ /ee/ /d/ to Read). There is no better way to exemplify this than in the following anecdote from Maryanne Wolf's book Proust and the squid: the story and science of the reading brain. By the end of this stage, the child “pretends” to read, can - over time - retell a story when looking at pages of book previously read to him/her, can names letters of alphabet; can recognises some signs; can prints own name; and plays with books, pencils and paper. The child acquires skills by being dialogically read to by an adult (or older child) who responds to the child’s questions and who warmly appreciates the child’s interest in books and reading. The child understand thousands of words they hear by age 6 but can read few if any of them. In this stage, the child is learning the relationships between letters and sounds and between printed and spoken words. The child starts to read simple text containing high frequency words and phonically regular words, and uses emerging skills and insights to “sound out” new one-syllable words. There is direct instruction in letter-sound relations (phonics). The child is being read to on a level above what a child can read independently to develop more advanced language patterns, vocabulary and concepts. In late Stage 2, most children can understand up to 4000 or more words when heard but can read about 600. In this stage, the child is reading simple, familiar stories and selections with increasing fluency. This is done by consolidating the basic decoding elements, sight vocabulary, and meaning in the reading of familiar stories and selections. There is direct instruction in advanced decoding skills as well as wide reading of familiar, interesting materials. The child is still being read to at levels above their own independent reading level to develop language, vocabulary and concepts. In late Stage 3, about 3000 words can be read and understood and about 9000 are known when heard. Listening is still more effective than reading. CV: A script you can read fluently works on you very differently from one that you can write; but not decipher easily. You can lock your thoughts in this as though in a casket. By this stage, reading is used to learn new ideas in order to gain new knowledge, to experience new feelings, to learn new attitudes, and to explore issues from one or more perspectives. Reading includes the study of textbooks, reference works, trade books, newspapers, and magazines that contain new ideas and values, unfamiliar vocabulary and syntax. There is a systematic study of word meaning, and learners are guided to react to texts through discussions, answering questions, generating questions, writing, and more. At beginning of Stage 4, listening comprehension of the same material is still more effective than reading comprehension. By the end of Stage 4, reading and listening are about equal for those who read very well, reading may be more efficient. By this stage, the learner is reading widely from a broad range of complex materials, both expository and narrative, with a variety of viewpoints. Learners are reading widely across the disciplines, include the physical, biological and social sciences as well as the humanities, politics and current affairs. Reading comprehension is better than listening comprehension of materials of difficult content and readability. Learners are regularly asked to plan writing and synthesise information into cohesive, coherent texts. Van den Broek, P., Tzeng, Y., Risden, K., Trabasso, T., and Basche, P. (2001) Inferential questioning: Effects on comprehension of narrative texts as a function of grade and timing. Journal of Educational Psychology, 93(3), 521-529.